A quiet hot spring district located in the Okuhida Onsenkyo hot spring village in Takayama City at the foot of the Hida Mountains (Northern Alps). The area's 11 ryokan inns and minshuku bed and breakfasts each have their own unique atmosphere and charm. There is also a footbath in the area which is free to persons staying at a local lodging facility. Located inside a 300 year old Japanese home called the Yadori-yu which was moved to this area, the footbath has a rest area with an atmospheric irori sunken hearth and can be used prior to checking in or while exploring the area. The area's springs are primarily regular simple springs or hydrogen carbonate springs, although the springs operated by some of the inns have more distinctive properties. A morning market is held in the district, and here visitors will find shops selling fresh, local vegetables and other foods as well as local specialty products. Note that when the market opens differs in summer and winter; visitors are particularly recommended search out some hoba miso (miso, mushrooms, meat, and other toppings grilled over a hackberry leaf) as well as a tin of Hida sansho (Japanese pepper). A historic hot spring district and, together with Arima Onsen in Hyogo Prefecture and Kusatsu Onsen in Gunma Prefecture, considered one of the three most renowned hot spring districts in Japan. 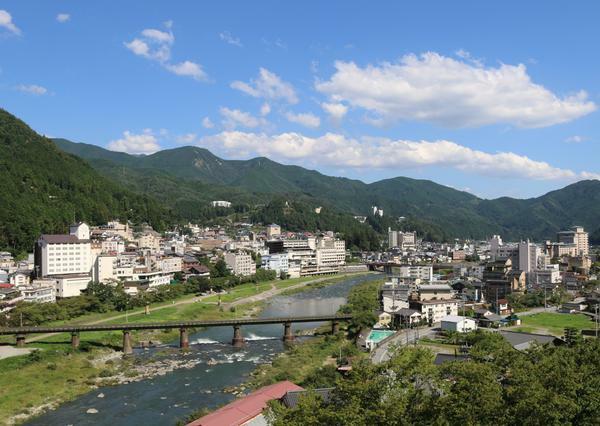 Sprawling along the Hidagawa River, the area is dotted with numerous hot spring inns, communal baths, and free footbaths, making it easy for visitors to enjoy all the delights of hot spring bathing. The area's simple alkaline hot spring waters are colorless and are notable for making the skin feel soft and smooth. The waters moisturize the skin and aid in heat retention. Also said to aid the removal of old, dead skin layers, these waters are known for their beautifying properties. The area is also dotted with natural carbonated springs welling up from underneath the ground, and this hot spring district is particularly popular with women. The oldest hot spring district in the Okuhida Onsenkyo hot spring village sprawling at the foot of Mt. Norikura. 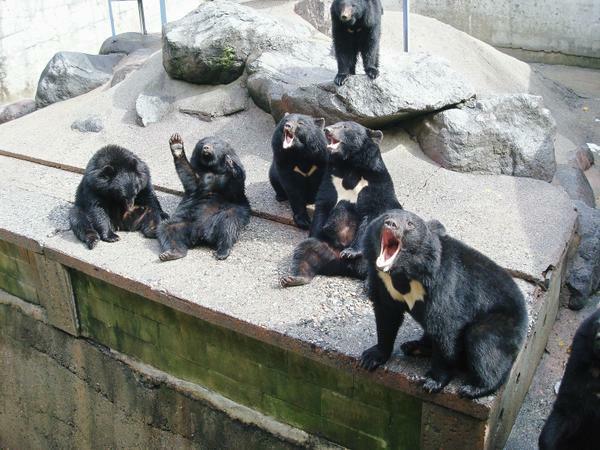 According to the Hishushi written at the end of the Edo period, the area was discovered when the mighty lord Takeda Shingen invaded the Hida region and happened to follow an old, white monkey to a hot spring. There are some 40 source springs in the district, and, depending on the location, visitors can enjoy a variety of hot spring qualities, including hydrogen carbonate springs, chloride springs, sulfur springs, and simple springs. 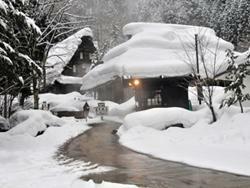 Located close to Kamikochi and Mt. Norikura, the district is also used as a base for mountain climbing activities. Hantai eggs, boiled eggs with firm yolks and soft whites, are a popular local specialty made using the area's high temperature hot spring waters, which reach up to 90 ° C.
A history-leaden hot spring district known as the Little Kyoto of Hida, one of its greatest charms is its old-fashioned townscapes, which still look much as they did during the Edo period. The area's colorless, mildly alkaline and hypotonic simple springs are said to aid recovery from fatigue and illness; promote health; and alleviate muscle soreness, joint stiffness, bruises, sprains, sensitivity to cold, and chronic digestive diseases. The Takayama Festival, held each year in April and October, attracts many visitors; considered one of Japan's three most beautiful festivals alongside Kyoto's Gion Festival and the Chichibu Night Festival, it is also registered by UNESCO as an example of Intangible Cultural Heritage. A hot spring district situated along the Nagaragawa River, a river famous for the traditional cormorant fishing conducted on it. The waters of the area's source spring are colorless when they emerge but turn a turbid red when they come in contact with air. A simple iron cold mineral spring, its waters contain an abundance of iron. At Nagaragawa Onsen, visitors can enjoy the stunning scenery created by Gifu Castle, conquered and taken over by the mighty Oda Nobunaga in the distant past, towering over Mt. Kinka; and the glassy Nagaragawa River reflecting star-filled night skies. Because of its distinctiveness, this hot spring district has even been granted a Regional Collective Trademark System by the Japan Patent Office. Many of the traditional ryokan inns standing along the Nagara River have free foot- and hand baths for tourists to enjoy. 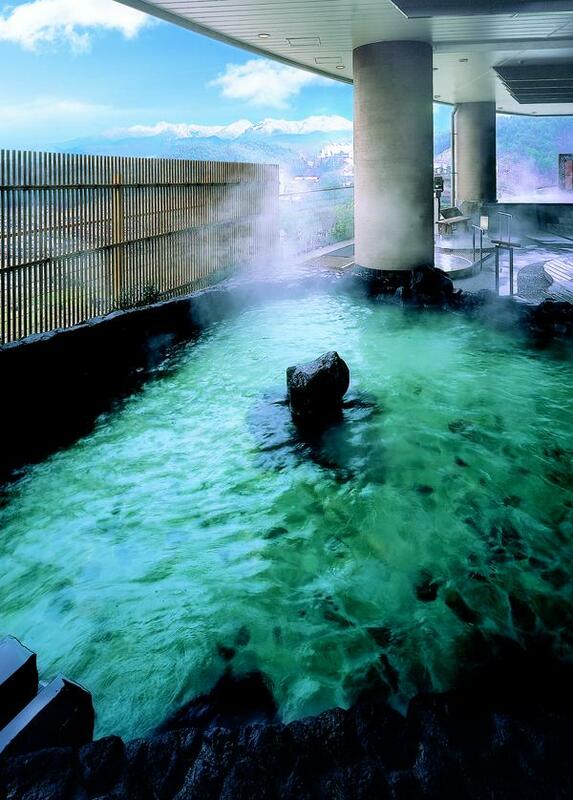 The hot spring waters here are said to treat nerve pain, muscle soreness, sensitivity to cold, and chronic digestive diseases, and Nagaragawa Onsen has been selected to appear in a list of Japan's top 100 hot spring areas organized by the Kankokeizai News Corporation five years running. A hot spring district located in the Okuhida Onsenkyo hot spring village; a local legend concerning a princess called Taruma-hime and the Okuhida's famous Taruma no Mizu spring has led to the district being considered a romantic destination and area which brings luck in love. The waters of the area's simple hot springs, hydrogen carbonate springs, and sulfur springs are said to have a variety of health benefits. In Shinhirayu's famed Shinsui Park, visitors can view beautiful Taruma Falls, fed by the waters of the Taruma no Mizu spring emerging from a rock halfway up a mountain. The Himuro Soba Festival, Ideyu Festival, and Taruma Kanegori Light Up events are held in the area each year in May, August, and from late December to late February, respectively, and each attracts large numbers of visitors. The surrounding area is dotted with popular sightseeing destinations such as Kamikochi's Hida Mountains (Northern Alps), Hida-Takayama, Hida-Furukawa, and Shirakawa-go, and visitors can also make use of inns and hotels here as a base for exploring the region. 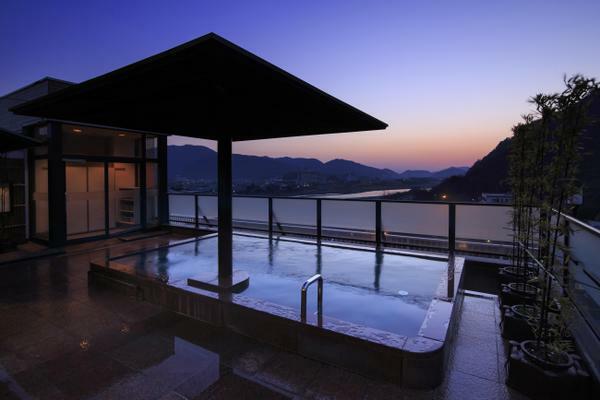 A secluded hot spring located in Itadori, Seki City, Gifu Prefecture, an area known as Okumino, its vaunted waters are used to constantly refill the tubs of the Shinmei Onsen Spa Resort Sugishima hot spring inn's bathhouse kakenagashi style. The colorless, mildly alkaline simple spring's waters are said to treat stiff shoulders, rheumatism, joint pain, and atopy and other skin diseases; they are also said to grant beautiful skin to bathers. The inn complex, an estate built by a wealthy farmer 150 years ago and later moved here, combines the elegance of Hida culture with the simplicity of the rural Okumino region, giving it warmth and depth. The inn's bathhouse is also open to non-guests, who, with an advance reservation, can even use the private reservable bath. 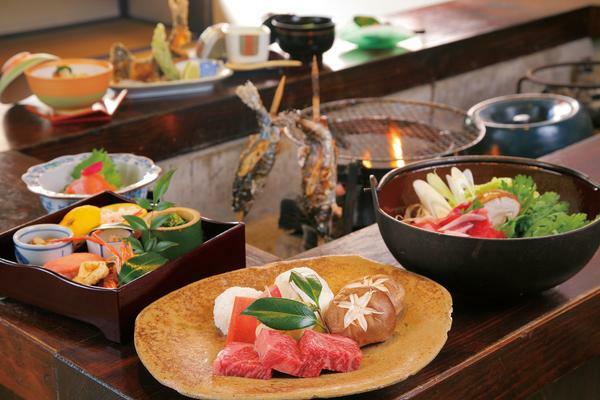 The inn serves a lunch which enables diners to revel in the tastes of Okumino and savor Hida beef; bathhouse entry is also discounted for diners. A natural simple alkaline hot spring located on the grounds of the Toyota Shirakawa-Go Eco-Institute near the Shirakawa-go World Heritage site 700 meters above sea level. The slippery waters of this piping hot, 52° C source spring leave the skin silky smooth. 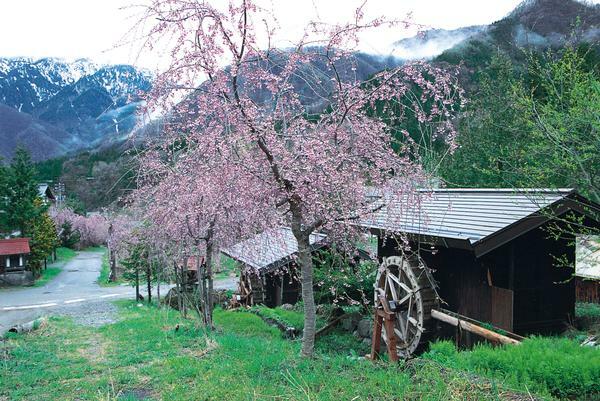 The Toyota Shirakawa-Go Eco-Institute offers visitors a variety of activities which enable them to surround themselves with nature and notice the activities and wisdom of the natural world. Examples include trekking in the virgin forest of Oshirakawa Ravine, on Sanpoiwadake, and amidst the thatch roofed homes of Shirakawa-go; or spending an evening in the thatched roof Shitayama Residence on the Institute's grounds, experiencing what life was once like here when there was no electricity and the only source of light at night was the fire in the central hearth. 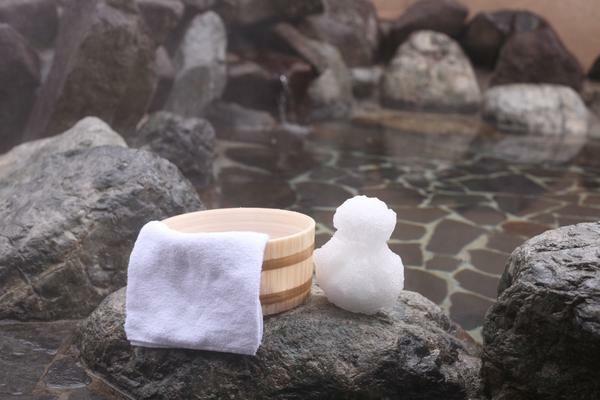 Staying in the Institute's lodging facilities, visitors can come in contact with the culture and natural beauty of the Shirakawa-go and enjoy relaxing hot spring baths.